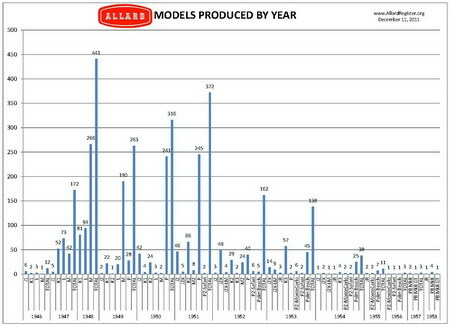 We thought you might it interesting to see a year by year chart of Allard production. This chart data is based on our chassis database, which was first created by Tom Lush for his definitive Allard book and then updated by the late Tom Turner and Bob Lytle. Over the past few years I have worked to clean up the database to improve the searchability and clean up bad references. The database continues to be a work in progress as we discover new (old) information. In the coming weeks, we'll post additional data from the database that we hope you'll find interesting.